ES25V P3 geyser water heater is 25 liter Capacity with ABS Outer Body. It,s 8 Bars Rated pressure and SafeCare Technology. This geyser water heater comes with 5 Star Rating (BEE) and Digital LCD Display. It has also comes with feature Remote Control, Real Time Clock and Adjustable Thermostat. The tank is proved to pass 160,000 cycles impulse test under 10 Bars, to ensure working pressure of 8 Bars. The TTS technology uses two sensors for complete protection from overheating. The twin sensors offers higher safety. By capillary type thermostat & thermal control to ensure an accurate temperature cut off. User can preset desired water temperature and the on and off time. The water heater will heat water to the preset temperature at the "on" time and switch "off" time. 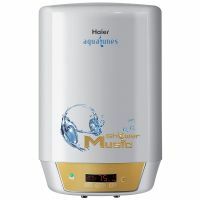 To Recieve updates and possible rewards for Haier ES25V P3 please sign in. To Recieve updates and possible rewards for Geyser/Water Heater please sign in.